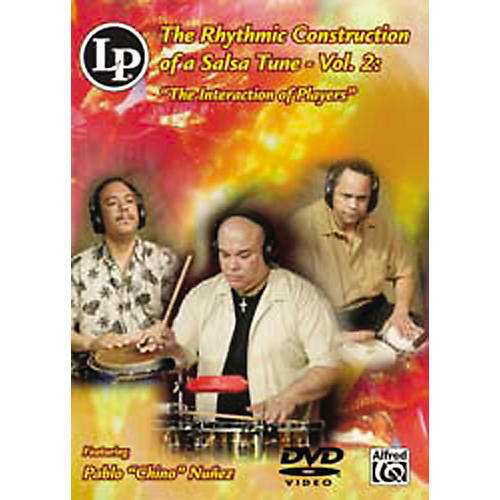 This new DVD, from acclaimed timbalero Pablo "Chino" Nu±ez, is the follow up to his popular and informative DVD The Rhythmic Construction of a Salsa Tune: Volume 1. This time, Chino and special guests George Delgado and Jorge Gonzalez move past the basic rhythms of Volume 1 and show the viewer the ins and outs of playing with other musicians. Learn how to start and finish songs, how instrument patterns and various instruments compliment one another, and watch how players interact with each other. Chino teaches five distinct Latin rhythms-Bomba, Cumbia, Plena, Calballo and Charanga-and demonstrates how each instrument-Timbales, Congas, Bongos, Plena, Guira, Giro and Cowbell-is played in each of the five songs. As a special learning feature, you can turn off any of the individual tracks and play along.